The Vikings play for a top-two spot but the Sixers will play to ruin their party. 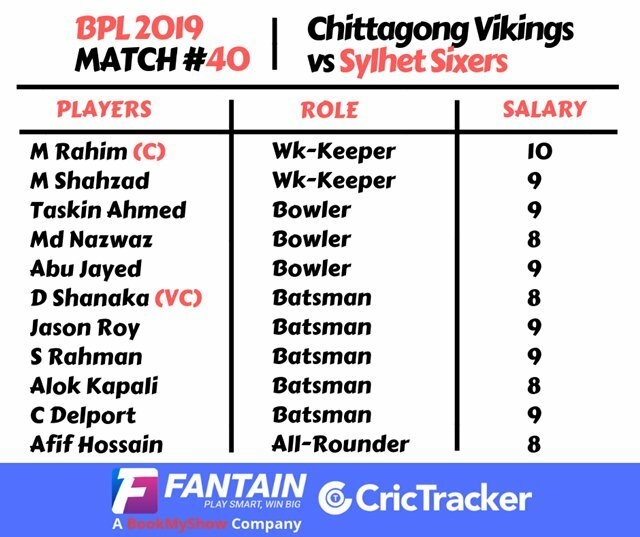 Chittagong Vikings and Sylhet Sixers come to match 40 of BPL 2019 with contrasting fortunes. While the Vikings are through to the knock-out stage with 14 points, the Sixers languish in the bottom tier with just 8 points. The Vikings were pushed to the brink by Dhaka Dynamites in their previous fixture but Abu Jyed and Dasun Shanaka ensured that the Vikings were headed onwards after all. While the Sixers play for pride, the Vikings will now have their eyes set of finishing in the top-two. Shahzad (WK), Delport, Rahim (C), Shanaka, Yasir, Mosaddek, Raza, Nayeem, Abu Jayed, Millon and Khaled. When Robbie Frylinck picked up an injury, it appeared as though the Vikings would struggle. But Abu Jayed has stepped up, led the attack and ensured that Frylinck’s absence was not felt one bit. The Vikings’ most recent win against the Dynamites was a shot in the arm for their morale and therefore, they are unlikely to make any changes. Roy, Afif, Sabbir, Pooran, Liton (WK), Nawaz, Tanvir, Kapali, Taskin Al-Amin and Samad. With the race for the next stage virtually over now, the Sixers could hand some match-time to the reserves now. Al-Amin might get a game and if this were to happen, Ebadat Hossain might be the one missing out. Taskin Ahmed and Nicolas Pooran lead the charts in the bowling and batting departments for the Sixers. With an aggregate of 379 runs, Pooran has delivered for the Sixers. Likewise, with 21 wickets, Taskin has delivered the good but unfortunately, he has waged a lone battle. Had he received more support from his colleagues, Sylhet would perhaps have been better placed. Cameron Delport: his all-round capabilities make him a valuable option for your Fantain Fantasy XI. This is our Fantain Fantasy XI but you’re the real expert. So check-in to Fantain, enter the various contests on offer and remember, #PlaySmartWinBig.